Waiting for biopsy results is nerve-racking, but a new tissue-imaging technique could cut down that stressful period to mere minutes. A novel microscopy technique developed at the University of Illinois is called nonlinear interferometric vibrational imaging (NIVI). It has been tested on rat breast-cancer cells and tissues and, in those tests, it produced color-coded images of tissue, outlining clear tumor boundaries with greater than 99 percent accuracy – and took less than five minutes to do so. Looking to remove some of the subjectivity from current diagnostic methods, the researchers sought to focus not on cell or tissue structure but on molecular composition. Normal cells have high concentrations of lipids, while cancerous cells produce more protein. NIVI identifies cells with unusually high protein concentrations, enabling accurate differentiation between healthy tissue and tumors, with no need to wait for a stain to set in. 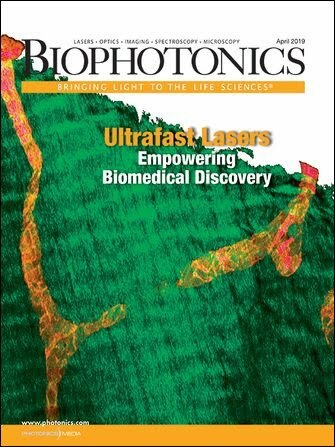 A new imaging technique uses laser light to identify cancer cells and could lead to real-time optical biopsies. From left, Eric Chaney, Stephen Boppart, Martin Gruebele and Wladimir Benalcazar of the Beckman Institute at the University of Illinois. Courtesy of L. Brian Stauffer, University of Illinois. Each type of molecule has a vibrational state of energy in its bonds that is unique. NIVI uses two beams of light to excite molecules in a tissue sample, enhancing the resonance of that vibration and producing a signal that can be used to pick out cells with high concentrations of that molecule. One of the beams of light is a reference, and combining that beam with the excited sample’s signal cancels out background noise, isolating the molecular signal. Then statistical analysis of the spectrum that results produces a color-coded image at each point in the tissue: blue for normal cells, red for cancer. Now the team is working to improve the technique and even broaden its diagnostic applications. The researchers want to speed it up to real time and are looking at new laser sources to make it more compact, perhaps even portable. They also are developing new light-delivery systems, such as catheters, probes or needles that can test tissue in vivo. Also, tuning the laser beams’ frequencies could enable tests for other types of molecules. The findings were published in the Dec. 1, 2010, issue of Cancer Research.